Sharon Lovejoy is my kind of lady! She loves gardening and kids, and especially combining the two. She's an award-winning writer, does her own illustrations, has lectured all over the country. I mean, is there anything this woman can't do? I've read a few of her books now, and what I like best about them is the warm, friendly tone and the ideas that actually seem attainable. They all inspire me to get out there and create some wonder in my garden with the kids. 4 stars: A collection of essays and illustrations from her column "Heart's Ease," written for Country Living Gardener magazine. Lovejoy's essays on gardening and wildlife are a pleasure to read. I wish we could be neighbors. I could use some good "organic gardening and lovin' the wildlife" vibes. The tone of the book makes it seem like she could be. 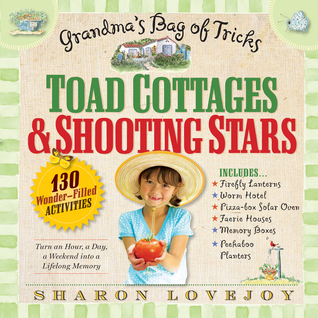 If you want more projects and less talk, read Toad Cottages and Shooting Stars instead. 5 stars: A primer on gardening with kids! Nine themed gardens to plant with your children, including a circular pizza garden (sectioned into slices, of course), a "snacking and sipping" garden, a moon garden, a garden of giants, and more! For each garden, she includes specific measurements, plant lists, and even recipes or craft projects to do along with the theme. 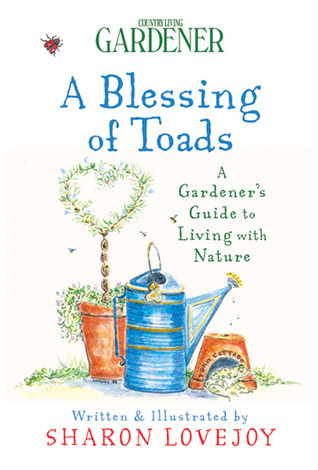 She also includes a chapter on Top 20 Plants for Kids, a section on gardening basics, and a Resources list for ordering supplies. The themed gardens all require quite a bit of space, but that's the beauty of the Top 20 Plants list. If you don't have much room, but still want to put in a few things for the kiddos, turn to the list. You will find not only vegetables, but also plants to touch and smell and taste, along with plants that have flowers or seedpods or other features just right for kid craft projects or fairy houses. 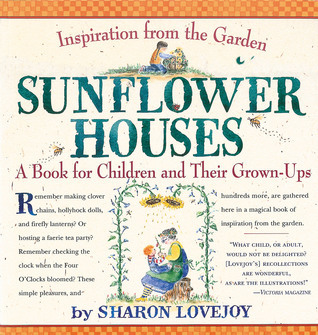 By the way, this one has more detailed instructions for planting the sunflower house mentioned below, if that's what you're interested in. 4 stars: A scrapbook of joyful gardening experiences. This is a grab-bag of gardening memories, favorite flowers, projects, and activities to do in the garden with children. 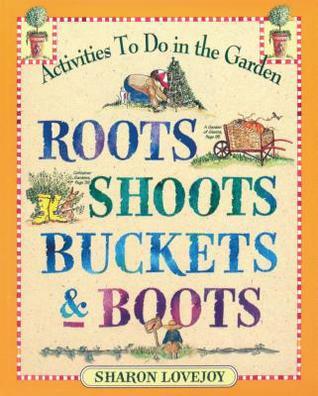 Some of the chapters are more hands-on, and include instructions for making secret hideaways, wearable flower and leaf creations, and dolls and toys from garden materials. Others are more reminiscent in nature. As in some of her other books, she includes a list of plants for children, in a table format, with a brief summary of what in particular makes each one child-friendly. Tucked onto nearly every page are quotes, poems, and illustrations. Great to settle in with for an hour or two, or to dip into here and there. The projects in this one do not have the specific instructions like in Roots, Shoots, Buckets, and Boots, but are presented more as general ideas with a few practical tips. 5 stars: You don't have to be a grandma to make the most of these fun ideas! Full of fun things to do with grandchildren--easily adaptable to engaging and playing with the children in your life, whatever their relationship. Most of the ideas are simple--like waking the child up to watch shooting stars, and growing avocado pits in a jar of water--but the simplicity makes them that much more accessible. As you can see by my ratings, I tended to enjoy the more practical, hands-on books a little more. Just reading them gets me excited for summer again, and doing fun garden projects with the kiddos! I'm telling you now--there WILL be a sunflower house in our future! I would dearly love to plant it this summer, but with the move and the baby, I'm making no promises. In fact, I haven't even brought it up to my kids, in case it doesn't happen, but if I have any kind of energy left you know what I'll be doing! In the meantime, there are several simpler ideas that I know we could fit in this summer. Then you have to report back on what you try! I plan to do the same.